On March 8th, Rotarians across Britain and Ireland will break for tea and jam to celebrate an historic milestone: their dramatic success in the campaign to rid the world of polio. Rotary Clubs across Britain and Ireland plan to host simultaneous Purple4Polio Tea Parties. The tea parties will all begin at the quintessentially British tea-time of 4pm. The Purple4Polio campaign resonates with the International Women’s Day 2017 objectives ‘Be Bold For Change’ and Rotary fully supports gender equality. The Rotary polio campaign is particularly relevant to women. It dates back to 1985 and the ambitious promise Rotarians made to the mothers of the world that polio would be eradicated and their children would no longer suffer from the life threatening and crippling disease. That promise is on the brink of being fulfilled, with just 37 polio cases in three countries in 2016. There are real hopes that 2017 will see the last case of polio worldwide. The IWD Purple4Polio Tea Parties will be kicked off with a media launch at the Rotary London headquarters in Regent’s Park. It will be opened by TV Presenter Konnie Huq with celebrity guest speakers including Jane Garvey of BBC Radio 4’s ‘Woman’s Hour’ and Purple4Polio Ambassador and broadcaster, Julia Roberts. To support the tea parties and Rotary’s campaign to end polio forever, Typhoo Tea, the second largest tea manufacturer in the UK is organising a tea-tasting at the launch, and donating tea and branded disposable mugs. Somnath Saha, CEO, of Typhoo Tea, says: “Uniting communities to help eradicate polio is essential and we’re proud to be a part of helping achieve this. Working closely with Purple4Polio nationwide, we’re hoping our charitable tea parties will bring people together to cross the finishing line and end polio now”. 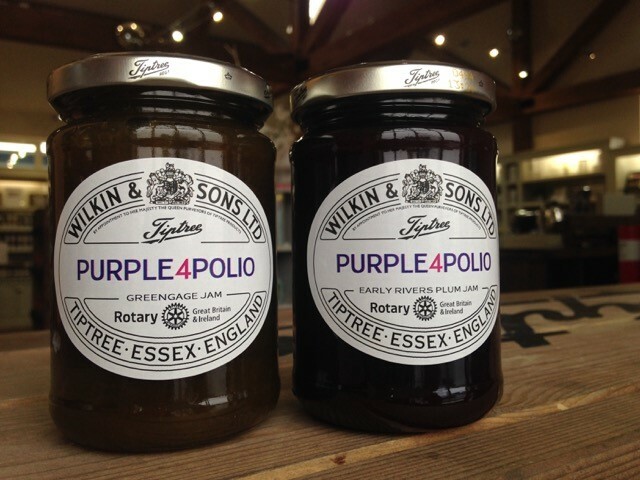 Wilkin & Sons Ltd. (Tiptree Jam) has given 52,000 specially branded jars of plum and greengage Purple4Polio jam to Rotarians across Britain and Ireland. They will be encouraged to use the jam to raise awareness of the Purple4Polio campaign and to fill the empty jars with coins. The aim is to raise up to GBP1 million, and with matching funding through Rotary, this GBP1 million will become GBP3 million. The Executive Board of the World Health Organization at its meeting in Geneva last week noted that the world is closer than ever to being polio-free, and urged for increased support to the remaining endemic countries. ​- Julia Roberts, broadcaster, author and Rotary Purple4Polio Ambassador. Julia contracted polio when she was just 14 months old but went on to become a professional dancer; the start of a long and successful career in the entertainment and broadcasting industry. - Jane Garvey, the presenter of BBC Radio 4’s ‘Woman’s Hour’ will share her stories of hugely inspirational women, in honour of Rotary’s many humanitarian projects to help women around the world. - and Emily Buchanan, author and former World Affairs Correspondent for the BBC, will speak on why a woman’s perspective is so vital in news coverage. The mesmerising young singer from Yorkshire, Bethany Hare will provide a musical interlude. Bethany won a Rotary ‘Young Citizen Award’ when she was 12 for her inspirational fund-raising. Her charity, Bethany’s Smile, has raised tens of thousands of pounds for children with life-threatening illnesses. Typhoo and Tiptree Jam will also be represented at the event. Outside London, there are plans for Rotary Districts and Clubs to host their own Purple4Polio tea parties with local celebrities. Rotary has spent more than 30 years campaigning against polio. Last year, there were just 37 cases worldwide in three countries: Pakistan, Afghanistan and Nigeria. These are challenging places to work and more funding is still needed to eradicate the disease there and to keep the rest of the world polio free. Rotary’s partners in the Global Polio Eradication Initiative: the World Health Organisation, Unicef, the US Centers for Disease Control and Prevention and the Bill and Melinda Gates Foundation are all confident that 2017 could see the last case of polio. There need to be three years with not a single new case anywhere, for the whole world to be declared polio-free. Rotary International in Great Britain and Ireland’s campaign is called Purple4Polio as purple is the colour of the dye put on the little finger of millions of children during mass immunisation campaigns. The IWD Purple4Polio Tea Party launch is at 2pm, 8th March 2017. Address: 6 York Gate, Regent’s Park, London NW1 4QG. Rotary International in Great Britain and Ireland will be posting on the day about the events via twitter.com/RotaryGBI using #IWD2017 and #Purple4Polio, also on facebook.com/RotaryinGBI. Rotary International in Great Britain and Ireland is a volunteer organisation whose 50,000 members use their skills and time to improve the lives of others both locally and globally, while building friendships and having fun in the process. There are nearly 1,800 Rotary clubs across Great Britain and Ireland. Rotary International was founded in 1905 in Chicago and is now the world’s largest international service organisation with over 1.25 million professional men and women as members. There are 34,000 clubs in more than 200 countries and geographical areas. Wilkin & Sons Ltd. are very pleased to be able to provide Purple4Polio preserves so that each Rotary member can fundraise for this worthy cause to eradicate polio throughout the world. The Wilkin family have been farming at Tiptree, Essex since 1757 and Mr Arthur Charles Wilkin made the first strawberry jam at Tiptree in June 1885. Today traditional English fruits are still grown on the farm and the range of products made by Tiptree has widened to include marmalades, curds, savoury products, Christmas puddings and fruit gin liqueurs. Founded in 1903, Typhoo is the largest private label tea packer and the second largest tea manufacturer in the UK. Producing 125m teabags a week at its factory in Moreton, Wirral, Typhoo Tea’s current sales value exceeds £80m. With over 60% of the retail branded market, Typhoo Tea produces, markets and distributes the iconic British tea brand Typhoo as well as the authentic Welsh brand Glengettie, Scottish Brand Melrose’s, leading instant tea brand Lift, healthy infusions brand Heath & Heather, speciality tea brand Ridgways of London, London Fruit & Herb as well as coffee brand Red Mountain. Since 2005, Typhoo Tea Ltd has been jointly owned by the Apeejay Surrendra Group (an Indian conglomerate with tea plantations in India, interests in real estate, shipping, hotels, retail and financial services) and Global Tea and Commodities Ltd (a UK conglomerate with tea, coffee; chocolate plantations in Malawi and tea packaging in Mombasa, Kenya). Rotary Districts and Clubs around GB and Ireland will also be posting from their own social media accounts about their IWD Purple4Polio Tea Parties. This press release was distributed by ResponseSource Press Release Wire on behalf of TaylorKerek in the following categories: Children & Teenagers, Men's Interest, Health, Women's Interest & Beauty, Food & Drink, Business & Finance, Education & Human Resources, Medical & Pharmaceutical, Media & Marketing, Public Sector, Third Sector & Legal, for more information visit https://pressreleasewire.responsesource.com/about.